Warlis are tribals who live in Thane district in the hinterland of Maharashtra, in simple dwellings of clay and reed plastered with cowdung. Basically tillers of land, the tribals have deep faith in their own deities which they depict in various forms. At weddings, festivals, ceremonies, and births, their homes are decorated with a wide range of symbolic patterns, asking for the continued benevolence of the gods. 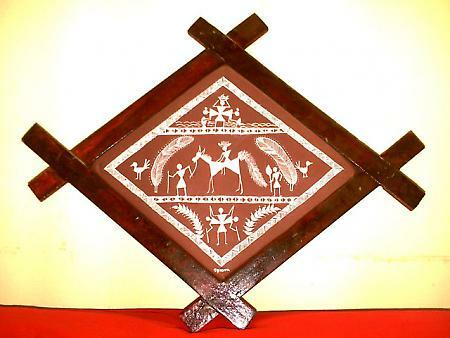 This tradition has given rise to Warli paintings. The mud walls are first smeared with a paste of cowdung. When this dries a coating of red mud or gheroo is applied to give body and texture to the background. Pounded rice mixed with milk and water and red sindur are applied with a brush made from the twigs of trees. Simple folk symbols drawn with bold, easy strokes are dominant. Simple diagonal, vertical, and horizontal lines form the design. Triangles are created and beautified by the addition of trees, animals, human forms, the sun, and the moon, forest, huts, and implements. White is the colour in which the image of the goddess is created since this colour is held to be sacred and pious. Other figures are drawn in the red and yellow since these are easily available in the form of turmeric and the red kumkum powder. The sacred pictograph is executed in rice-paste with a straw. The Warli paintings are simple but expressive. The commercial paintings done on paper or on cloth are executed with white poster paint on a dark background made of cowdung or mud mixed with glue. This remains the only adaptation. Stylistically, they remain unvaried and as powerful as the paintings originally drawn on walls.